A black vulture perches on a fence post at Shepherd of the Hill Fish Hatchery in Branson, Mo., in April 2009. Black vultures have extended their range from South America and the southeastern U.S. into Midwestern states such as Missouri, Illinois, Indiana and Ohio. ST. LOUIS — Farmers and ranchers in parts of the Midwest are fending off a new menace: the federally protected black vultures, which swoop down and peck newborn calves and other small animals to death. Some cattle producers have lost multiple calves to vulture attacks that have become increasingly common over the past decade or so. Lambs, goats, foals and other animals also have been victimized. Missouri has long been home to turkey vultures, a large but relatively harmless bird that feeds off the carcasses of dead animals. 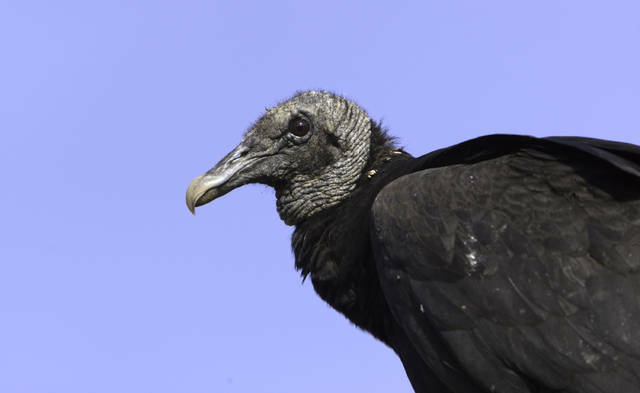 The black vulture does, too, but it also attacks live animals. The black vulture, more common in South America, gradually made its way north, first into the southeastern U.S. In recent years, the range has extended into the southern parts of Missouri, Illinois, Indiana and Ohio. Tom Cooper, an expert on migratory birds for the U.S. Fish and Wildlife Service, said warmer winters are part of the reason black vultures have ventured further north. Missouri Department of Conservation spokesman Francis Skalicky said both types of vultures serve a vital purpose. The problem is that the black vulture, unlike the turkey vulture, also feasts on live animals, especially helpless small ones. Experts say the vultures, traveling in gangs, prey on newborn calves, sometimes even during the birthing process. Most of the victimized livestock are less than 2 weeks old. “They gang up on them, they start pecking them, and it is a fatality for the livestock,” Skalicky said. Agricultural and wildlife experts say the number of calves or other livestock killed by black vultures is unknown. The problem seems worse in the Midwest because farmers and ranchers are still learning how to deal with the attacks, Cooper said. Defending against them is even more difficult because the vultures are protected by the Migratory Bird Treaty Act. Farmers and ranchers can shoot them, but only with a permit. Proof of damage is required to get the permit. Experts say one nonlethal way to ward off attacks is to hang a replica of a black vulture in effigy near where the calves and other animals congregate. Farmers also are encouraged to remove calf afterbirth quickly since black vultures are attracted to it. Black vultures are smaller than turkey vultures, and with different coloring. The turkey vulture is typically 32 inches long with a 72-inch wingspan, while the black vulture is typically 25 inches long with a 57-inch wingspan. The black vulture has a black head with white tips on the undersides of the wings. Turkey vultures have red heads as adults, and the immature ones have gray heads.